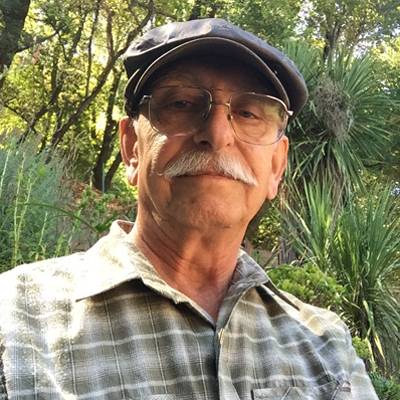 Friends of Merrymeeting Bay’s (FOMB) fifth presentation of their 22nd annual Winter Speaker Series: Cobboseecontee: On the Edge of Restoration features Steve Brooke from Upstream. This event takes place in the Morrill Meeting Room of Curtis Memorial Library in Brunswick on Wednesday February 13th at 7pm. Dammed at its head of tide in 1761, Cobboseecontee Stream is the largest coastal watershed in Maine (after Presumpscot River/Sebago Lake) still impassible to native migratory fish. A tributary of upper Merrymeeting Bay, the Cobboseecontee watershed includes the communities of Gardiner, West Gardiner, Litchfield, Richmond, Winthrop, Manchester, Monmouth, Readfield and Hallowell. 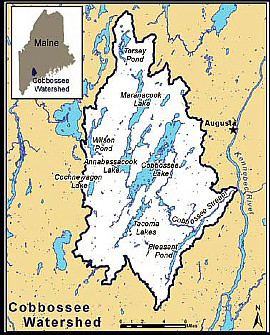 It contains 20.3 square miles of lakes and ponds, the largest being Cobboseecontee (Gunscook), Maranacook and Annabesacook. 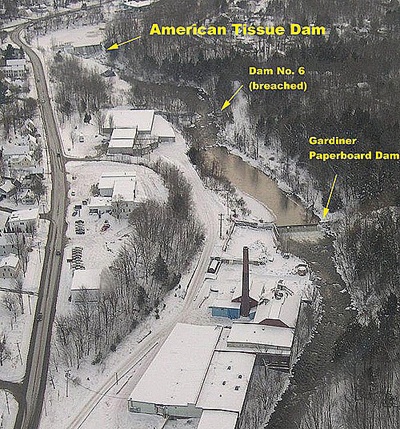 Working from 1998-2004, a consortium of local citizens, citizen conservation groups and state and federal agencies secured $125,000 in funding for the necessary engineering studies, legal permits and construction contracts to breach and remove the first dam in the watershed, the 180 year old Gardiner Paperboard dam in downtown Gardiner. After the hired contractor failed to perform the dam removal in autumn 2004, the dam and adjoining property were subsequently sold to several entities, the most recent of which has declined interest in re-initiating the dam removal project. Options available for securing native fish passage include public/private efforts by willing dam owners to provide fish passage, invocation of the State of Maine’s fishway law and use of the Endangered Species Act for endangered Atlantic salmon native to the watershed. Steve Brooke served as Project Coordinator of the Kennebec Coalition during the decommissioning and removal of the Edwards Dam in Augusta on Maine’s Kennebec River. After retiring from the State Planning Office, he works with “Upstream”, a Gardiner, Maine group working to return river herring to the Cobbossee watershed. FOMB hosts their Winter Speaker Series October-May, the second Wednesday of each month. Their March 13th presentation, The Fascinating Life Cycle of Native Plants features Heather McCargo, Executive Director of Wild Seed Project. Speaker Series presentations are free, open to the public and supported by Patagonia, Inc. in Freeport. Visit www.fomb.org to see speaker biographies, full event schedules, become a member, and learn more about how you can help protect beautiful Merrymeeting Bay. For more information contact FOMB at 207-666-3372 or edfomb@comcast.net.